Scroll down for a free printable Map Of Iowa Counties, and another map of Iowa cities. The above US map shows the location of the state of Iowa in relation to other US states. 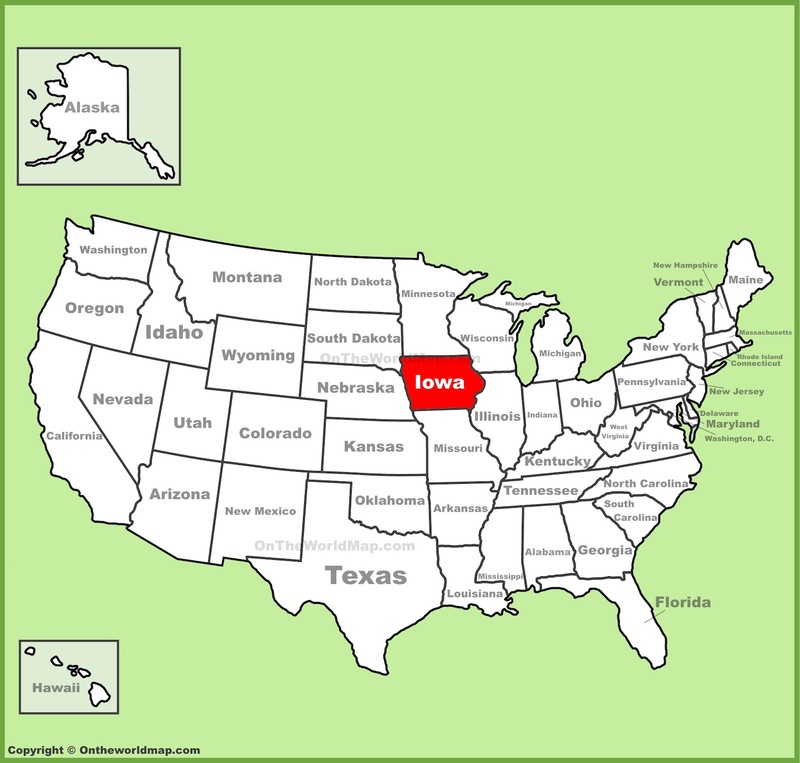 Iowa was the 29th state admitted to the Union, on December 28th of 1846. This page also features fascinating facts about the state of Iowa, and related links to more free printable items. What is now the state of Iowa was once inhabited by a Native American people known as Ioway. Sliced bread was invented by a man from Davenport, Iowa. The house featured in Grant Wood's famous painting, American Gothic, is located in Eldon, Iowa. Another famous feature of Eldon is that it is the hometown of actor Tom Arnold. Two gymnastics gold medalists - Shawn Johnson and Gaby Douglas - trained at Chow's Gymnastics and Dance Institute in Des Moines. When Rob Lowe was playing in a celebrity golf tournament in West Des Moines, a ball he hit struck and killed a goldfinch in mid-flight. It could never happen twice. Following the incident, Iowa actuaries calculated that the odds of someone going to Iowa and killing the state bird with a golf ball are 1 in 747 million. The city of Sabula, Iowa is actually an island. It is located just off the eastern border of the state, about 100 miles east of Cedar Rapids. America's first female lawyer was from Iowa. Iowa has the highest concentration of wind turbines in the United States. In fact, more than 25% of the state's electricity comes from wind power. Clear Lake, Iowa is where "the music died" in 1959, when a plane carrying Buddy Holly, Ritchie Valens, and the "Big Bopper" crashed into a field, killing all of them. Above: An enhanced, printable map of Iowa cities. 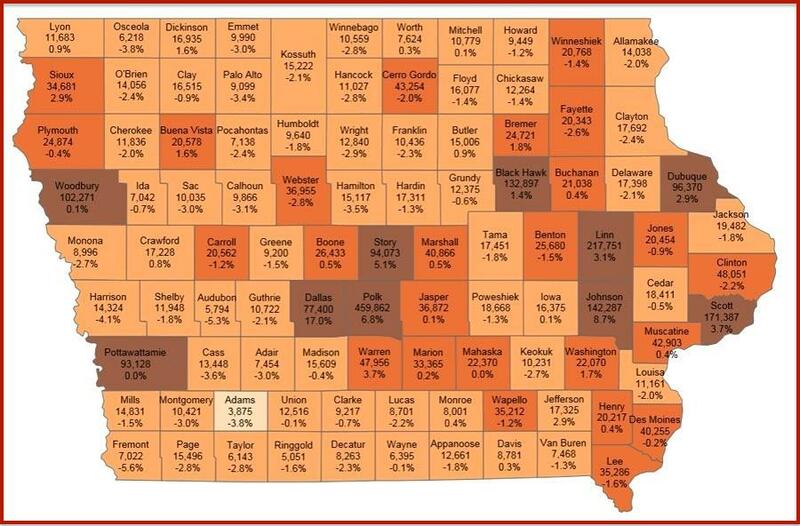 Shown above: A printable map of Iowa counties.